It’s been an unusual week, with lots of ups and downs. 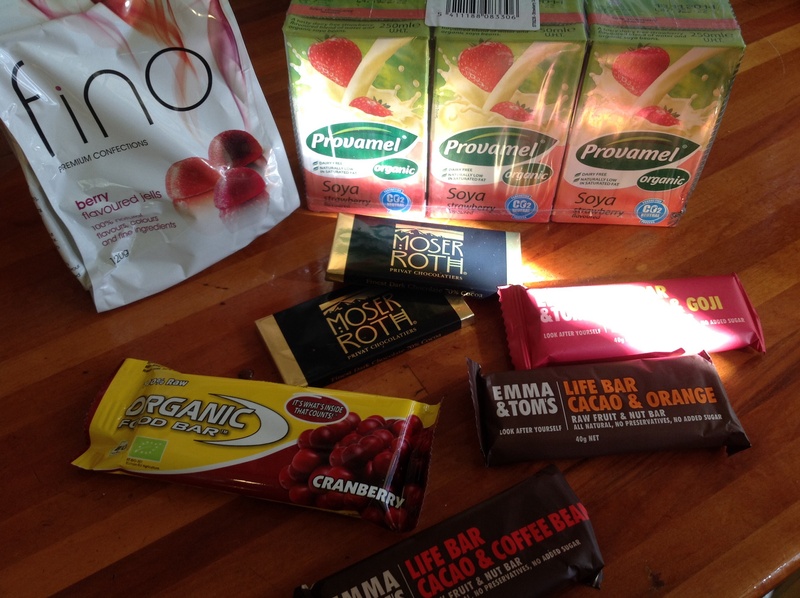 We’ve had a death, a birthday, a painful cyst and tomorrow, we have a big exam (or our son does) – and all of these occasions called for vegan foods that I don’t usually make. I did quite a bit of Googling and flicking through cookbooks, and here’s what I came up with. Last Sunday night, my husband B’s favourite uncle died. He was around 80 and hadn’t been well for a while, but for some reason, it was still a shock. B’s mum and sister were in the air, flying back to see him, but sadly, didn’t quite make it in time. He is the last member of that side of the family left in Ireland, so it’s really the end of an era. We couldn’t get to the funeral, but we wanted to have our own memorial for him back here in Australia. He wasn’t a big-drinking, party-loving Irishman; he was more of a quiet night and a good book kind of Irishman, so we decided to have a quiet night at home. I dug out the photos from our family trip to Ireland in 2007, and B’s trip in 2012. I put them together in a slideshow that I set up to run on the TV. 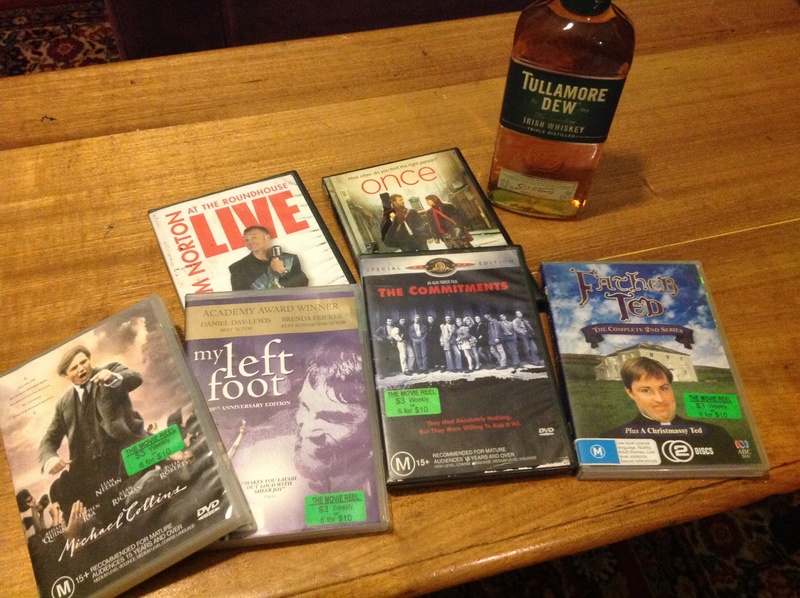 I got some Irish music playing on Spotify, bought a bottle of Tullamore Dew Irish whiskey, and a pile of Irish DVDs. 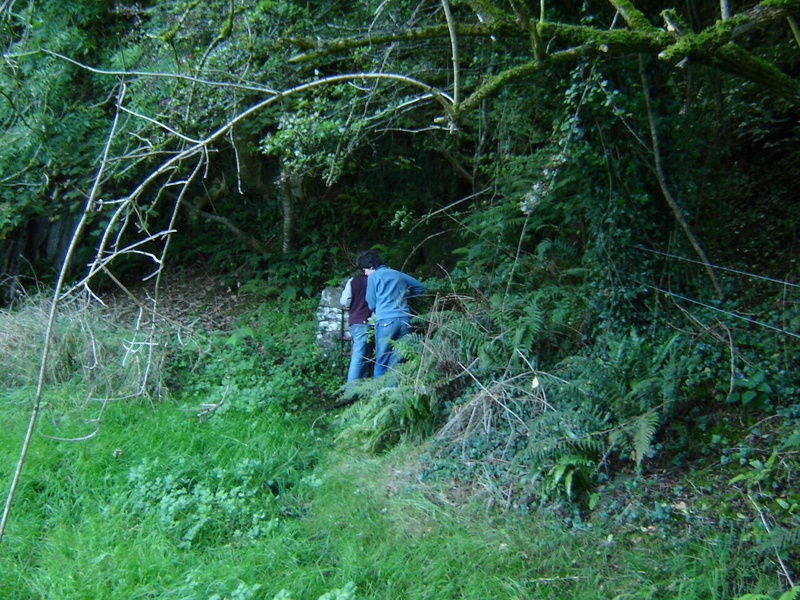 Then I hunted around for something Irish to cook for dinner. Luckily, Colleen Patrick-Goudreau comes from an Irish background (who would have guessed, with a name like that?). 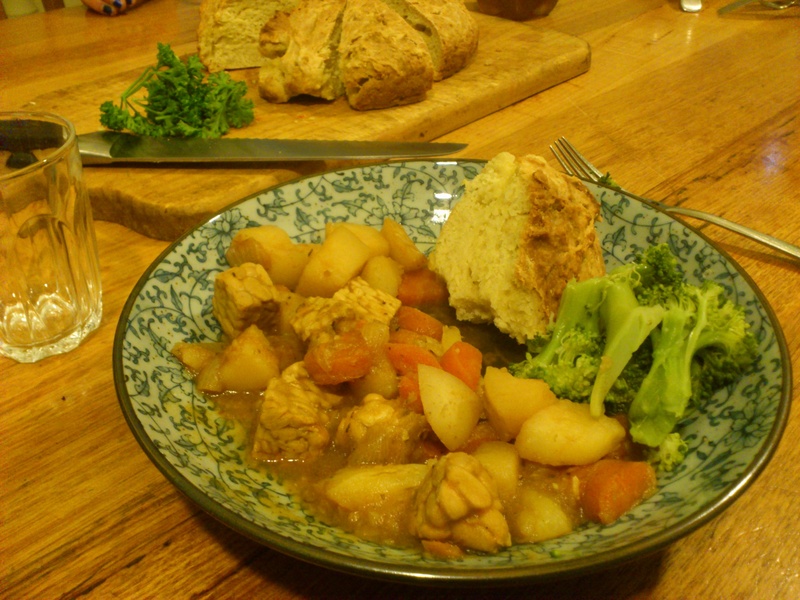 I cooked her Irish Stew and Soda Bread from The Vegan Table. They were quick, easy and really lovely comfort food for a chilly, winter night. The stew uses tempeh in place of meat, by the way. It was a really nice evening, and I think he would have enjoyed it. We ended up falling asleep watching Michael Collins. My son is an adult! In the middle of this week, our son, P, (who happens to have been named after this lovely uncle) turned 21. He didn’t have time for a big celebration this week, because he has a big exam coming up tomorrow, so we had another quiet dinner at home with his usual birthday favourite – spaghetti with bean bolognaise sauce. H, our daughter, whipped up a fantastic cake while I was at work. It was a work of art that just kept growing as she kept adding all of her brother’s favourite foods and flavours. Oh it was good! It was a double layer chocolate cake (the Budget Chocolate Cake from the Australian Women’s Weekly chocolate cake cookbook), iced with peanut butter frosting, decorated with chocolate icing made with real chocolate, peanut brittle and chocolate lattice thingies on top. What a winner! I hope she makes this again for her dad’s birthday next month. So, with the funeral/memorial and the birthday out of the way, we thought we could relax. Not so. Last night P realised that the mild, nagging pain he’d been trying to ignore while he was studying had turned into intense, throbbing pain and had been joined by a big swelling in his mouth. A cyst he’d had around the root of one of his wisdom teeth had raised its ugly head again – even though that tooth was removed in February. With his big exam tomorrow, we had to move fast to get him better! Along with antibiotics and painkillers, I needed to prepare some foods that he could eat with his sore mouth, but that would satisfy his always-raging appetite. 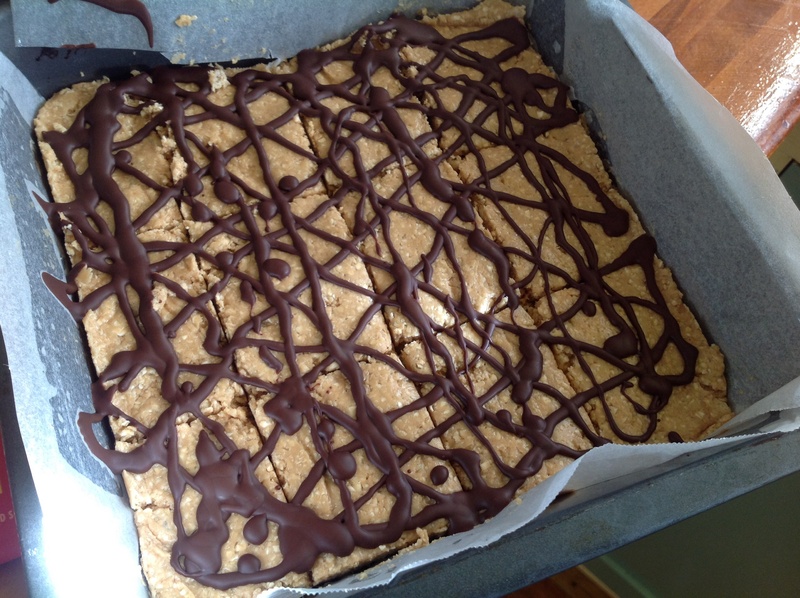 I found these Quick ‘n Easy No-Bake Protein Bars on Oh She Glows! I had all the ingredients, and they really were quick and easy…and yummy. He’s been devouring them all afternoon – now I’m worried he’s going to feel sick! I had way too much chocolate to drizzle on, so it looks a bit crazy – but the more chocolate, the merrier, I say. The sore mouth also ruined our plans for his snacks during the marathon exam. He loves crunchy muesli bars, but there’s no way he would be able to chew those. Assuming that the Power Bars will be gone by tomorrow, I checked out the supermarket and put together a big pile of snacks for him to choose from. Obviously he’s not going to eat them all or he’ll get some kind of sugar shock! Yes, these are all sugar laden, but all the savoury snacks I found were crunchy! I’ve opted for a hearty soup for dinner tonight. That will be nice and gentle on the gums. ‘See-in-the-dark soup’ from Roz Denny’s Cooking for your vegetarian kids is a family-favourite comfort food – just perfect on this cold, dark night. 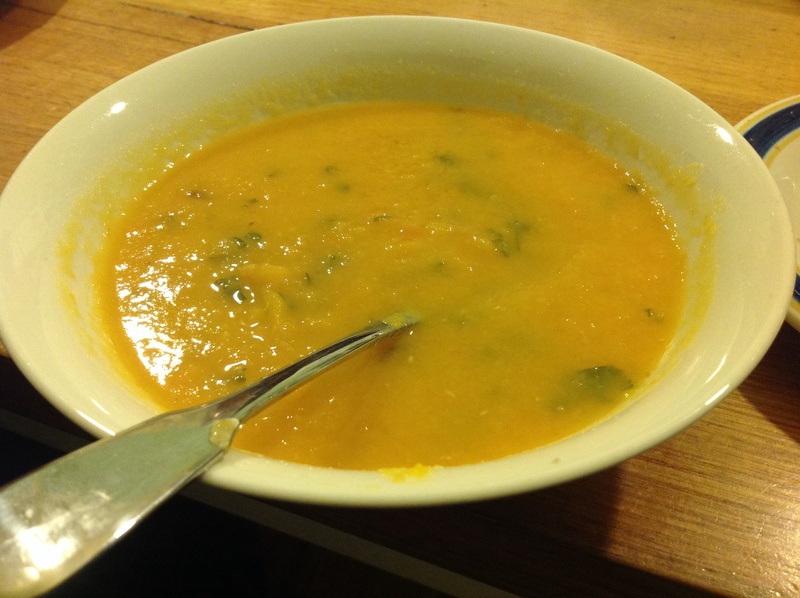 It’s basically a delicious, pureed carrot and red lentil soup. This soup usually looks bright orange, but this time it looks like rockmelon and mint puree! Still tasted just as good though. And now we’d better get sorted out and off to bed early, because he needs to be up at some ungodly hour for the marathon exam. Fingers crossed that the infection, the medications and the loss of sleep don’t affect his results! Here’s one of the songs that we listened to while drinking Tullamore Dew – Van Morrison and the Chieftains’ Carrickfergus. ← No more shivering this winter! How weird. This comment was stuck in the back end waiting for approval…which I haven’t set up. Thanks. It seems like everyone has recovered from funerals, tooth cysts and too much birthday cake now. We’re just waiting for the exam results – and I must make another batch of those bars for the new school/uni term/semester. Wow that is quite some week – sorry we couldn’t see you yesterday – I love your Irish memorial – we watched Once recently and loved it (and I have seen the rest of the DVDs except Graham Norton live – E is not a fan of his though I have watched his shows occasionally). Hope that it was helpful (sorry can’t find the word) for B’s mum and sister to be there for the funeral even if they missed seeing his uncle. 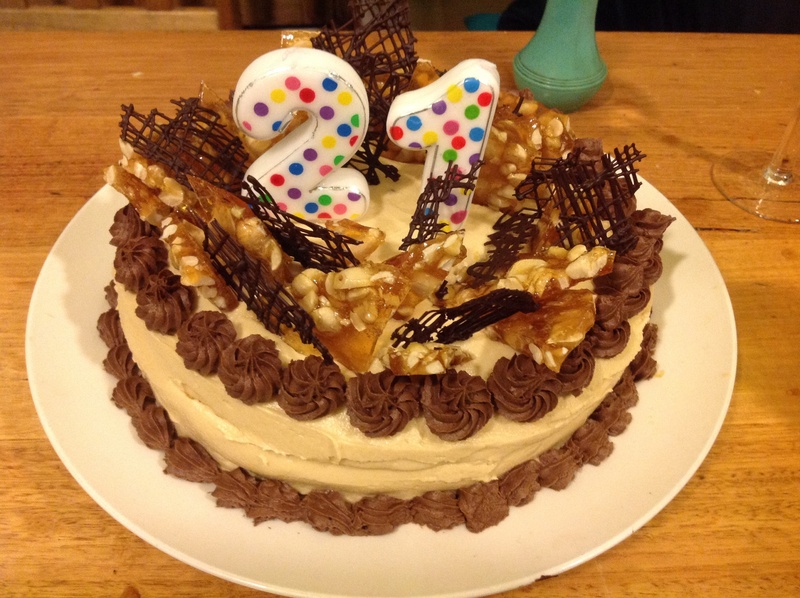 Love H’s cake – great piping skills and what a great celebration cake. Sorry to hear about your son’s cyst – and rotten timing – hope the exam went well today. The week really took it out of us – we were all asleep before 10pm last night! Yeah, Graham Norton’s not for everyone, but we’ve had a bit of a soft spot for him since we saw him singing Bohemian Rhapsody as the obnoxious youth group leader on Father Ted, while we were actually in Ireland. The house where we were staying in Ireland had a Father Ted DVD and it was set at ‘The Very Dark Caves’ where we had been that very morning – so it was all very exciting. We didn’t actually end up watching this standup DVD though. What a lovely way to remember someone special! And what an amazing cake, phwoar!! Thanks. We’re crossing our fingers for good exam results. Hopefully the pain meds didn’t mess with his mind too much! That song has made me cry for B and his uncle and all of you really. I know how much you all loved him and I was thinking how lucky P and H were to meet him and visit the place where B spent so much time as a boy. Big hugs to all of you. Crumbs, I think I could do with a whiskey myself. Hope the exam went well. Oh and the cake is spectacular.